Once the Christmas decorations come down on 12th Night, January seems to be such a miserable month; grey skies, lots of wind and rain, and short days. It’s easy to feel grumpy, especially if you are also trying to battle with the knock-on effects of the Christmas excesses. 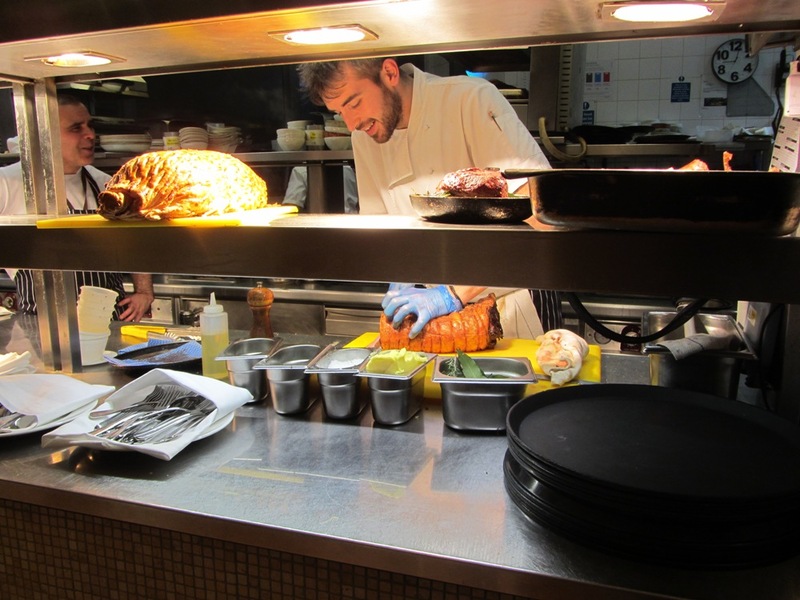 What could be better than being told that Roast has devised a special dish which promises to be so full of good things that your mood will be enhanced? I really did have to see if this could deliver its promises. 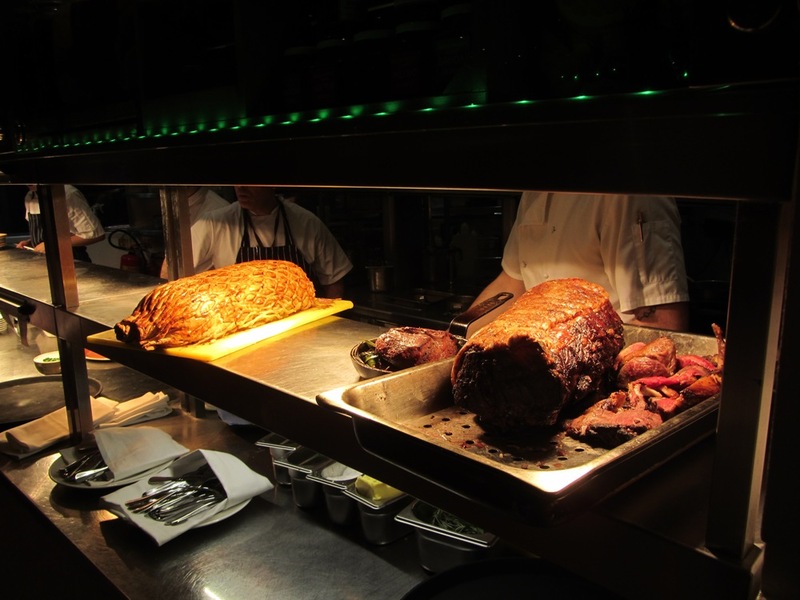 Roast Restaurant is situated in the heart of foodie paradise otherwise known as Borough Market. It unapologetically focuses on fantastic quality British produce, and as its name suggests the emphasis is on meat dishes, but there are some fish dishes, vegetarian and even vegan options on the menu too. I think that roast pork might have been on Sunday’s menu! I have to say, that I do like being able to see the chefs at work. These looked very happy. I started my meal with seared scallops with grapes, fennel, candied walnuts, and ginger. They were beautifully caramelised on the outside, but oh so soft and tender in the middle. 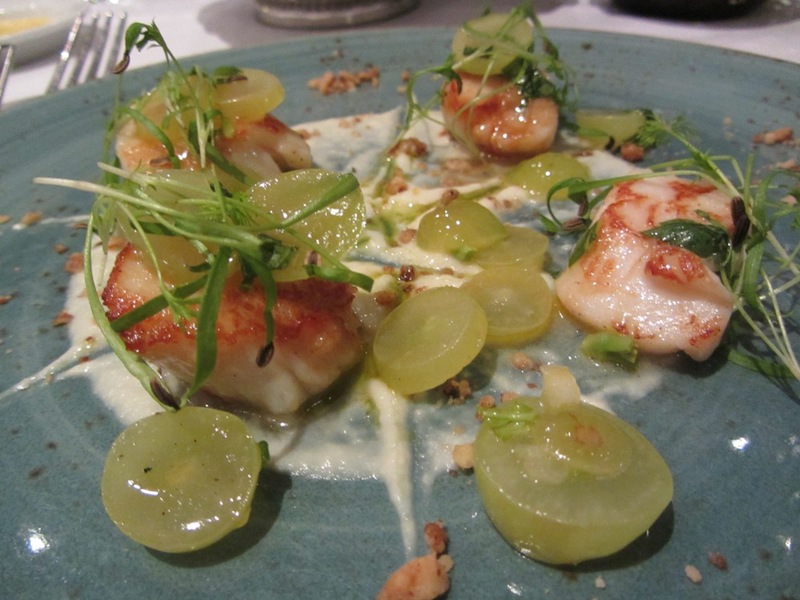 It would be easy to overpower the scallops with the ginger and fennel, but the chef had used a light touch and the dish was cooked to perfection. 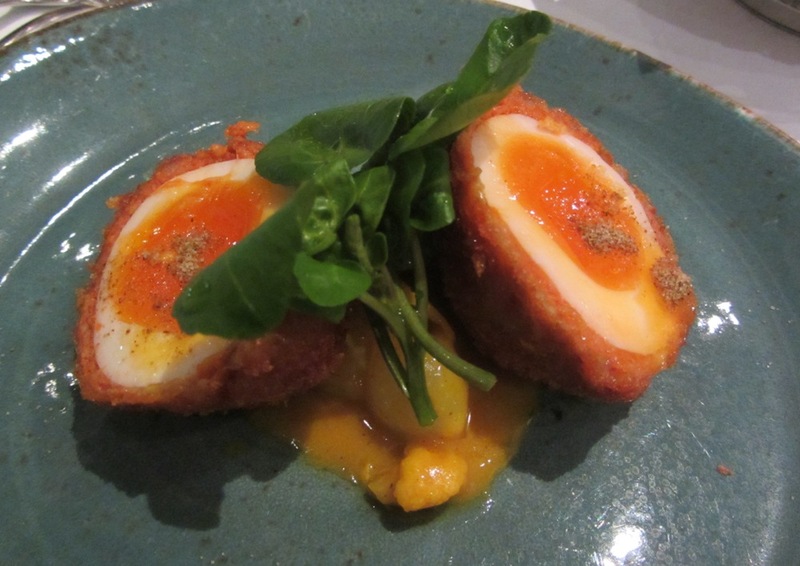 Meanwhile, Alex opted for the heartier Chorizo Scotch egg with piccalilli. The yoke oozed in a very seductive manner. Then we moved to the main event, the reason for our visit; the January Special: the Mood Boosting Roast. This was a whole-roasted poussin with chocolate black pudding stuffing, broccoli, beetroot, sweet potato, and a red wine & chocolate gravy. It seems that science has proved that these ingredients will lift your mood and boost energy levels. 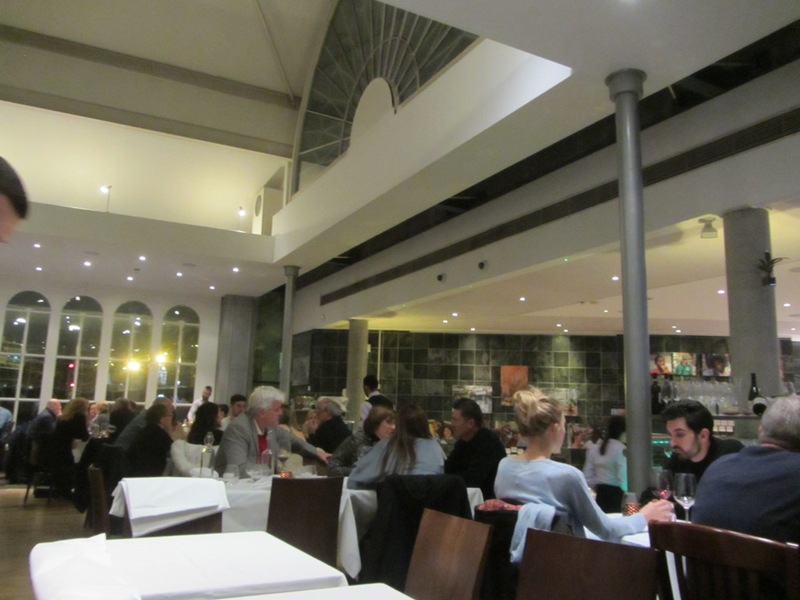 As you would expect from a restaurant of this calibre, every aspect of the dish was prepared perfectly. The stuffing was hidden behind the watercress in the cavity; it was a good thing that we’d remembered it was on the menu, or it would have been easy to miss and that would have been a terrible shame as it was one of the standout components of the dish. 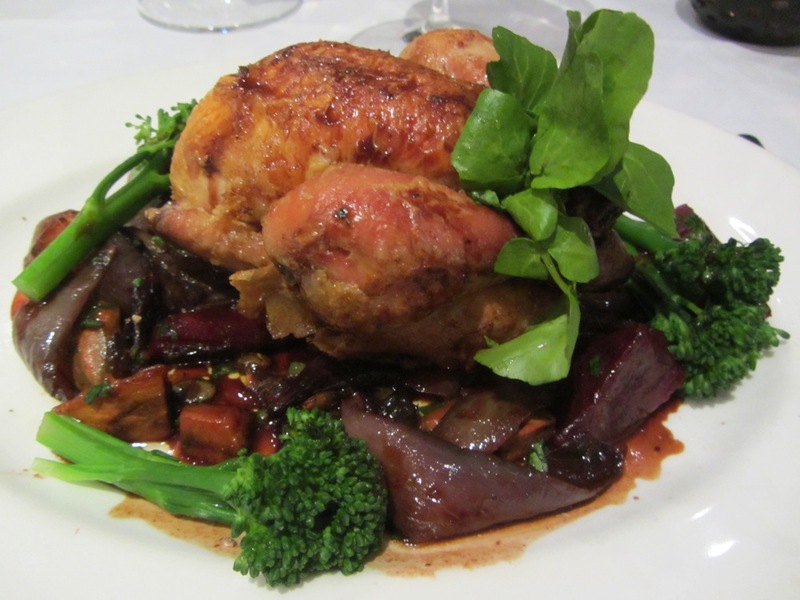 I loved the gravy and the beetroot too, as well the moist poussin. 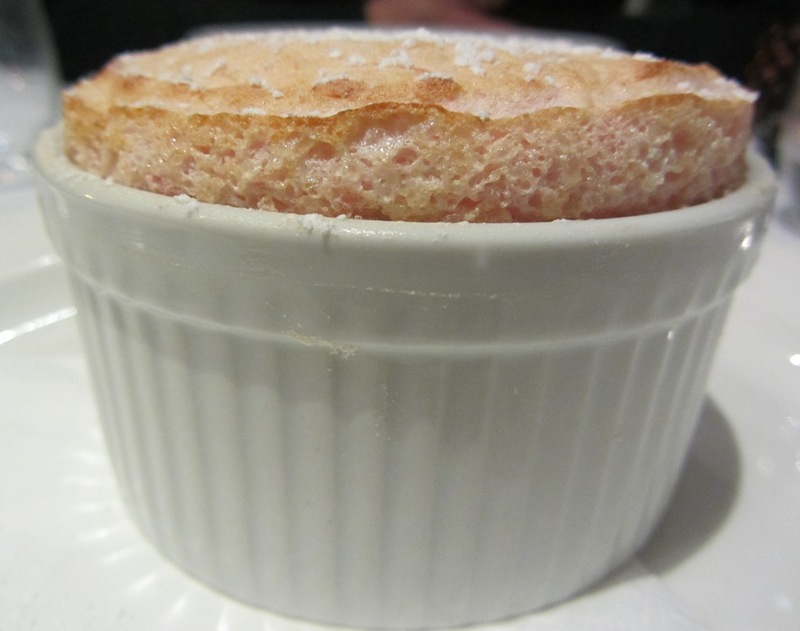 I’m not normally a pudding person, I’m far more likely to opt for the cheeseboard than something sweet, but I love rhubarb, and the first forced rhubarb of the year from Yorkshire was on the menu contained within a delicate and light soufflé. 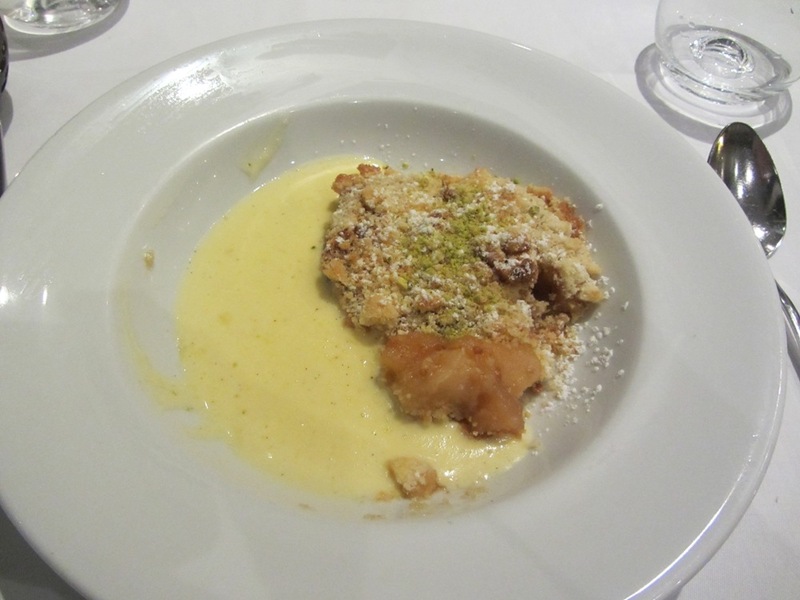 Bramley apple, pear and rum soaked sultana crumble with English vanilla custard spoke to Alex, and was consumed with great gusto. So how were our spirits after the meal? Besides feeling pleasantly full, we were both happy and ended up staying up chatting until the small hours. Today we’ve painted bedroom walls, done a small food shop, made a meringue case for a pavlova, washed and dried 3 loads of washing, written this, and will now start on the ironing, and cooking the evening meal. So I’d say that the energy levels are pretty high! If you’d like to try the mood enhancing roast chicken to see if it has the same effect on you, then you’ll need to get a move on as the special only runs until the end of January. 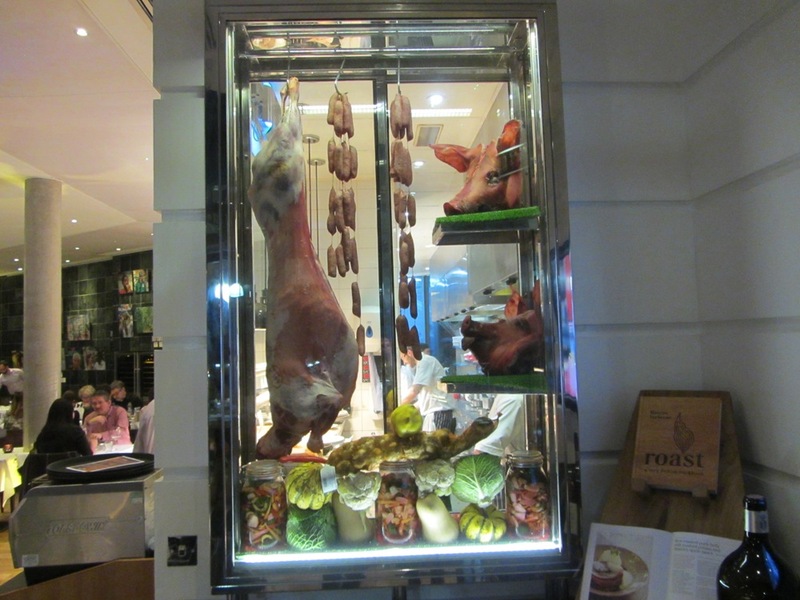 Mind you, look at that Beef Wellington; there are many reasons to visit this excellent restaurant.